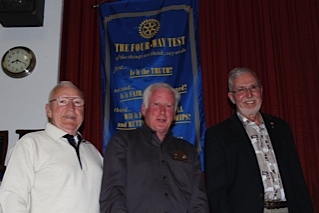 A panel of current Rotarians spoke about the history of Rotary in Powell River. Between them, they have a total of 117 years in Rotary. 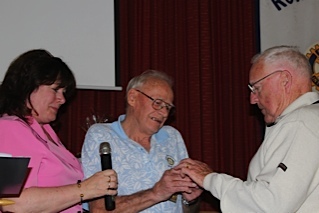 From left: Bruce Smith, now a member of The Rotary Club of Sidney By The Sea; Don Logan, The Rotary Club of Powell River; and Don Jones, The Rotary Club of White Rock, who has been a member for 50 years. All three are former presidents of the The Rotary Club of Powell River. Thank you to Joyce Carlson for the photos and editorial. Rotary Anns were a spouses auxiliary formed in 1914. It was not until 1987 that women were invited to join Rotary International. One of the presidents of Rotary Anns in Powell River was June Vogl, whose husband Bud was club president in 1969-70. 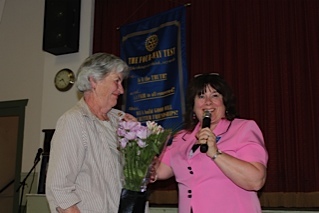 Membership director Joyce Carlson presented June with a bouquet of flowers in appreciation of her attendance. Long-time member Kip Brown, 1991-92 club president, presented a Paul Harris Fellow to Bruce Smith in recognition of him funding a Brooks Secondary School bursary for a graduating student for many years, including some after he had left Powell River. Also attending Heritage Night was Antoinette Knight whose first husband Joe Folliet was instrumental in creating the Popeye, Olive Oyl, Brutus and Wimpy characters for a Rotary parade float. The characters are now installed at Willingdon Beach Campsite. 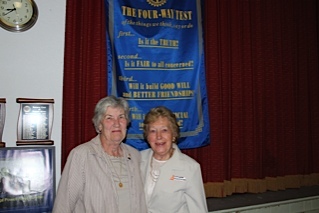 June Vogl and Antoinette were Rotary Anns together. Prior to 1987, Rotary International was a strictly male organization. Their wives were affectionately called "Rotary Anns." Since the clubs of the west were inviting the Rotarians to hold their next convention in San Francisco, a number of songs and stunts were organized which would be performed in Houston. One of the Rotarians wrote a "Rotary Ann" chant. On the train's arrival at the Houston depot, a delegation greeted the West Coast Rotarians. One of the greeters was Guy Gundaker of Philadelphia, whose wife was also named Ann. The group loved the title given to the two women named Ann. Immediately the same term of endearment was used for all of the wives in attendance and the name "Rotary Ann" was here to stay and the subsequently formed Rotary Ann auxiliary worked along side Rotarians to bring the entire family into the Rotary World. Both Brunnier and Gundaker served at Rotary International presidents and their wives became “First Ladies” of Rotary. Tonight we have a former Powell River Rotary Ann president with us – June Vogl who is wearing her Rotary Ann president’s pin.